With approximately 180 million cards exchanged industry-wide (not including packaged kids’ valentines for classroom exchanges), Valentine’s Day is the second largest holiday for giving greeting cards. Nearly 50 percent of all Valentine’s Day cards are purchased in the six days prior to the observance, making Valentine’s Day a procrastinator’s delight. Around 85 percent of all valentines are purchased by women. 73 percent of American men buy flowers on Valentine's Day. 15 percent of U.S. women send themselves flowers on Valentine's Day. According to U.S. candy manufacturers, Americans spend more than $1.1 billion each Valentine's Day on candy. 65 percent of those celebrating the holiday give a card, followed by a gift (46 percent), date night (44 percent), candy (38 percent), flowers (32 percent), plush toys (21 percent) and jewellery (11 percent). St Valentine's Day, the day of days for lovers, is held on February 14. In 2011, it is a Monday, so not so romantic. However, Feb 13, the preceding day, is truly beautiful from the cosmic point of view, so maybe you could have your Valentine's Date a day early! After all, it's Valentine's Day Eve! Read on to find out about the meaning and origins of Valentine's Day, the Festival of the Wolf Goddess! St Valentine's Day (February 14th) is nowadays a fabulous festival of mating and dating, set in memory of more than one early Christian saint called Valentine. 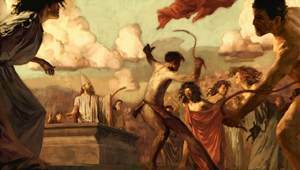 However, its origins really have little to do with these early holy men, for it is in effect a christianized version of the older, ancient Roman festival of the Lupercalia, the Festival of the Wolf Goddess. The Lupercalia was a fertility festival of the wolf goddess, Lupa (the mythical wolf-nurse of Romulus and Remus), combined with the Festival of Juno, the queen of the Roman pantheon. Juno's festival was held on February 14, the eve of the Lupercalia, which began on the 15th. Ancient days were reckoned from evening to evening rather than from midnight to midnight as we do now (hence the prominence of "eve's", as in Christmas Eve, New Year's Eve, Halloween, etc). The festival featured orgiastic rites, typical of ancient matriarchial societies. According to Plutarch's Life of Caesar, it was originally celebrated by shepherds and had some connection with the Arcadian Lycæa. On the eve of the festival of Lupercalia, it is said that the names of Roman maidens were written down and placed into jars (this must have been fairly late, as literacy was not the primitive strongpoint. Thayer indeed denies that it is anything other than a late fabrication, from 1756, in Alban Butler's Lives of the Fathers, Martyrs and Other Principal Saints—ed). Each youth would draw a girl's name from the jar and would then be partnered with her for the duration of the festival. Sometimes the pairing of the children lasted a whole year; sometimes they would fall in love and, in later patriarchial times, marry (the ancient goddess actually frowned on marriage...). During the festival, goats and dogs (unusual and significant victims) were sacrificed in the cave of the Lupercal. The blood was smeared on the heads of two chosen youths, then washed off with milk as a purificatory symbol of sacred rebirth. The youths would then run with their troupe of followers through the streets of Rome. According to Plutarch, these youths were naked except for the animal skins and carried strips or thongs made from the sacrificial skins, which they used to strike the women as they rushed ecstatically through the streets around the Palatine Hill, where the cave of the Lupercal was located. This was fertility magic, concentrated through the creation of the magic circle around the hill. The religious element was strong, as was the magical. Barren women sought to be struck with the thongs, as this was believed to cure their condition and make them fertile. It is likely that, in the most ancient times, the girls would have been the pursuers and struck the boys, but like most myths, this has probably been altered to suit later preferences. In Christian times this feast was renamed the festival of the Purification of the Virgin. Under the rule of Emperor Claudius II, Rome was involved in many bloody and unpopular campaigns. Claudius was finding it hard to get soldiers to join his military legions, for Roman men did not want to leave their lovers and families. Claudius therefore cancelled all marriages and engagements in Rome. Now Saint Valentine was a priest at Rome, in the days of Claudius II. He and Saint Marius are said to have aided the Christian martyrs and secretly married couples; for this deed, Saint Valentine was dragged before the Prefect of Rome, who condemned him to be beaten to death with clubs and have his head cut off. He suffered his martyrdom on the 14th of February, around the year 270. The fathers of the early Christian Church in Rome sought to do away with the pagan element in these feasts, by substituting the names of saints for those of maidens. And as the Lupercalia began about the middle of February, the pastors chose Saint Valentine's Day for the celebration of this new feast, replacing that of Juno and Lupa. So it seems that the custom of young men choosing maidens for valentines, or saints as patrons for the coming year, arose in this way. Nowadays we write and send cards for Valentines. Reputedly, there are more Valentine's Day cards sent each year in the USA than any other kind of card, save Christmas. Beats thwacking the maidens with thongs, I suppose. This custom has become vastly popular since the invention of the "penny post", because in earlier days, postal delivery was too expensive for most of us. Also the post before the introduction of the postage stamp was paid for by the recipient, rather than the sender. Not ideal for Valentines! Should we still celebrate these ancient festivals? With the decline in organised religion and the fragmenting of community, many of us in the West (and increasingly in the East) have lost touch with the grounding energies that revitalise us and our relationship with the Earth, the Cosmos and ultimately the Spirit. Seasonal festivities like Valentine's day mark pivotal phases in the ebb and flow of the tides of being, which once were more obvious in the agricultural and pastoral societies of the past. It is beneficial for modern people too to tune in and realign with the natural flows of the planet, so that we are able to restore the natural flows in our own energy systems by harmonising with a Nature that has been long suppressed. 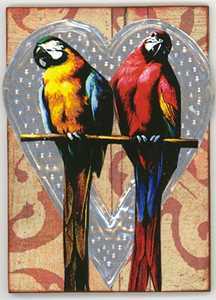 Interestingly enough, St Valentine's Day is traditionally the time when wild birds come together to mate. Now check out your Love Compatibility, according to your Stars! Leonhard Schmitz: Lupercalia, A Dictionary of Greek and Roman Antiquities, John Murray, London 1895.